Our first exhibition was held at St Wilfrid's Church in Bognor Regis in April 2009. It featured 12 high quality layouts in a wiode range of scales and gauges. We had support from 5 traders, a couple of whom have since become regulars. We were able to make a donation to both L'Arche and the Barnham Signal Box appeal from the proceeds. You can find information about both of these from our Links page. We have received a number of complementary remarks particularly in regard to the quality of the layouts. Visitors enjoyed the show often finding it surpassed their expectations. There was a good trade presence and they also found the day worth their while. Similarly, the all important visitors were appreciative of our efforts. You can find some pictures from the exhibition in our gallery here. Held again at St Wilfrid's but set back slightly to 1st May, we had 11 high quality layouts following the Industrial and Narrow Gauge theme in a number of scales. There was, as usual, anticipate excellent trade support as at our first exhibition together with society and local railway related organisations. Refreshments were available and the Hall was suitable for disabled access. We were extremely saddened to advise that one of our groups key members, John Hayward, passed away on Sunday 12th February. Despite severe health problems he remained an active modeller, served as the host for many South Downs Area Group meetings and was the inspiration behind that group's successful "SWING" exhibitions. This was far from the only area of activity for a man who lived life to the full. He will be greatly missed. You can learn more about his life and his many achievements here. 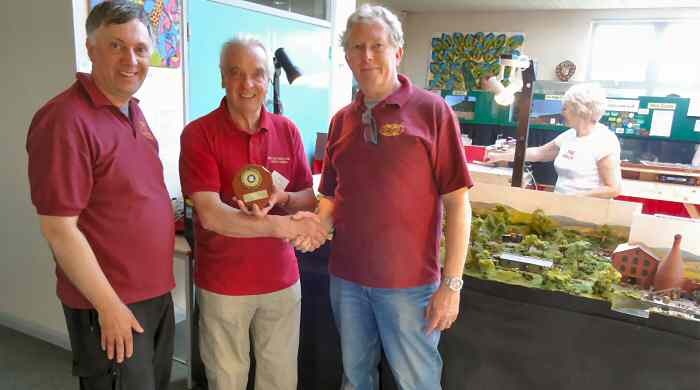 In his memory we decided that a "Best Layout of show" award would be made entitled the "John Hayward Shield". At this, its first show it was won, despite stiff opposition, by Keith Smith's superb rendition of the Selsey Tramway. We were again able to make a donation towards L'Arche from the proceeds. This year saw us move to a new venue. St. Mary's Centre in Felpham remained accessible but gave us greater space together with better car parking. We also moved even further into May in a partially successful attempt to avoid clashing with other shows. The extra space was used to create more space for visitors rather than more stands, thus addressing the only minor criticism we had achieved in the past. There were 12 layouts of the usual high quality and trade support included, for the first time, Squires and Smallbrook Studios together with our regulars. The John Hayward Shield was again up for grabs, and was joined by The Ernie House Trophy. Earlier this year we sadly lost yet another long-standing member, Ernie House, also the owner and builder of a lovely little 7 mm narrow gauge layout called “Little Bognor”. This trophy will be awarded to the layout adjudged the best by the “experts”, the other exhibitors and traders. On this occasion, in another close run race, both awards were won by a superb model of the Corris Railway in 009. We changed charities this year. As one of our members is partially sighted we agreed that we would support 4Sight, a charity dedicated to supporting the blind and partially sighted in Sussex. Once again at St Mary's the greater space proved beneficial as we had more people through the doors than ever before. Sadly, one of our regular traders, Falcon Figures was unable to attend due to a house move but Martin assured us he would be back in 2013. We had two new traders attending, Chris Ward with his range of 3D printed railway models and Paul Martin of EDM Models. We again supported 4Sight and were able to make a useful donation to them after all expenses were deducted. As usual, we had a range of superb layouts in a variety of scales and gauges. 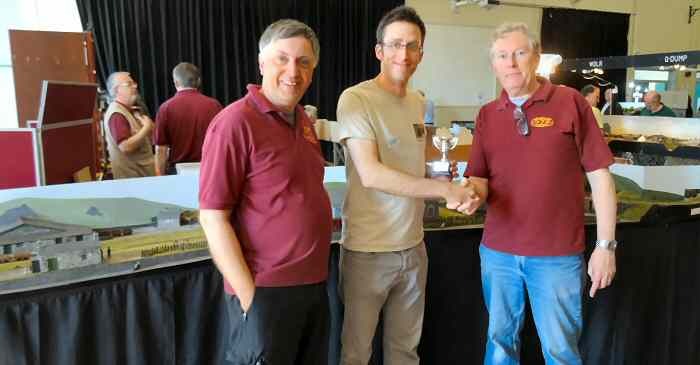 Once again both public and exhibitors were in agreement in judging the best layout of the show and despite stiff competition, both awards went to Giles Favell with his atmospheric O-16.5 and standard gauge layout. Some pictures of some of the layouts can be seen here. Continuing at St Mary's this exhibition showed that we are continuing to grow. We again supported 4Sight and were able to make a useful donation to them after all expenses were deducted. The awards were hard fought for this year with three layouts contesting for the awards. Two were, in fact, a dead heat. See our roll of honour page which also includes a brief tribute to Keith Willows, one of those winners, who sadly passed away in 2014. Once again at St Mary's, the exhibition was up to its usual high standards with a good attendance by enthusiasts. Sadly, unbeknown to us, it coincided with something called the "FA Cup Final" itself something to do with strange barbaric sport called "Feetbowl" or something similar. This had an impact on attendance by general public but, nevertheless, the show was well worthwhile. We were especially privileged that Peter Kazer, arguably the doyen of narrow gauge railway modelling, came all the way from Yorkshire with his latest layout. Little do those who prefer watching 22 overpaid grown men kicking a pig's bladder filled with air around a grassy field know what a treat they missed! St Mary's has proven to be a great venue while we continued to grow and become more established. This year, however, we decided that we were in a position to do better still and moved to a larger nearby venue - Felpham Community College. We had the largest number of exhibits and traders yet. Despite the odd hiccup things went generally well. We had a greatly improved number of visitors and received a great many complements from them as well as the traders and exhibitors. This is, of course, in no small measure down to them as well - we only provide the framework. Again, the awards were hard fought for this year. You can see below pictures of the two presentations by Richard Coney, the Secretary of the 7mm Narrow Gauge Association, in front of the respective layouts.